The graphics chip company did far better than analysts were expecting during the third quarter, with gaming GPUs leading the way. What: Shares of graphics chip company NVIDIA (NASDAQ:NVDA) jumped 11.8% during November, according to S&P Capital IQ data, driven by a strong earnings report. 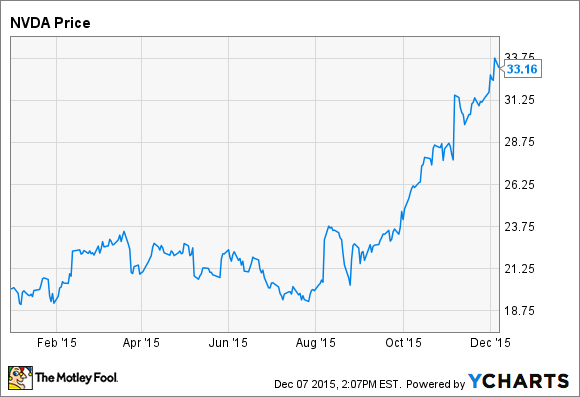 NVIDIA stock has been on a tear recently, rising more than 50% over the past three months. So what: Despite the current weakness in the PC market, NVIDIA blew past analyst expectations when it reported its third-quarter earnings on Nov. 5. Revenue grew 6.5% year over year to $1.31 billion, beating analyst estimates by $130 million, while non-GAAP earnings of $0.46 per share nearly doubled analyst expectations. NVIDIA's share of the discrete graphics card market has increased dramatically over the past year, and during the third quarter, the company claimed a unit market share in excess of 80%. This helped gaming GPU sales rise 40% year over year during the third quarter, and total GPU sales jump 12%. There were areas of weakness, specifically Tegra, professional GPUs, and data center GPUs, but NVIDIA's overall results were well ahead of expectations. NVIDIA also provided guidance for the fourth quarter than was significantly higher than analyst estimates. The company expects fourth-quarter revenue of $1.3 billion, compared to a consensus estimate of $1.21 billion, and $1.25 billion of revenue during the fourth quarter of last year. Now what: The PC gaming market has behaved largely independently from the PC market as a whole, and sales of GPUs, particularly higher-end models, are driving NVIDIA's exceptional performance. During the third quarter, IDC estimates that global PC shipments declined by 10.8% year over year. NVIDIA's OEM business is suffering as a result, down 45% year over year during the third quarter, but strong sales of gaming GPUs more than made up for this decline. NVIDIA competes with Advanced Micro Devices (NASDAQ:AMD) in the graphics card market, and AMD's recent struggles have been a boon for NVIDIA. Currently, AMD's PC segment is losing money, and its latest graphics card launch was lackluster at best, failing to disrupt NVIDIA's leadership position. The continued success of NVIDIA's gaming business despite a weak PC market surprised analysts during the third quarter, and investors pushed the stock higher in November as a result.